Art Therapy is a psychological therapy that uses visual art as its primary medium but may also use music, poetry or story as a trigger for creative work. It is particularly useful for individuals who may find verbal communication difficult for a variety of reasons or who may use language as a defence. 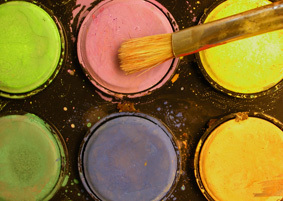 Art Therapy is practiced with both groups and individuals, it benefits clients in helping them express and contain potentially disturbing issues in a way they can manage. The art created may be discussed during a session, to explore the feelings it communicates, though this may not be needed. Indeed it may be counterproductive in that the art itself being all the expression that is needed. For the therapist, the art created can offer important clues to what is behind their client’s distress and their progress and recovery may be mapped or documented by their artistic creations. Art therapy can have profound effects in enabling people to get in touch with and express their feelings, whilst also being stabilising because of the engagement with physical materials ie clay, paint, photography. It has been observed that art allows us to find ourselves and lose ourselves at the same time. Part of its value as therapy is that, like other arts therapies, it can offer a means of expression without words. This way it can get directly to the heart of emotions and provide an emotional outlet that feels safe because it is contained in the artistic creation and within the therapeutic relationship. It can also reach beyond cultural limitations.